We are profoundly aware of every customers reqirement to maintain product integrity and consistancy of process output. The only way to effectively control and measure this is by obtaining true representitive samples every time you take one. Our sampling systems are the worlds best. Offering complete repeatability of your sampling process and absolute clarity of the sample taken. The M4 sampling valve is the smallest Keofitt® valve, designed for sampling of low viscosity products, with particles up to 1.5mm in diameter. The main product range the M4 valve is used for has 0-100cP viscosity. The W9 is the standard Keofitt® sampling valve, the valve others are measured to. Designed for sampling medium viscosity products, with particles up to 3 mm in diameter, if fitted with PTFE membrane and 2mm when fitted with silicone or EPDM membrane. W9 valves are mostly used for products that have about 0-1,000cP in viscosity. The W15 sampling valve is designed for sampling high viscosity products or for large samples of medium or low viscosity products, with particles up to 8mm in diameter. The main product range the W15 is used in have about 0-50,000cP viscosity. The W25 is the largest Keofitt® sampling valve. Designed for sampling of very high viscosity products or large samples of high viscosity products, with particles up to 17mm in diameter. The main product range the W25 is used in has 0-250,000cP viscosity. 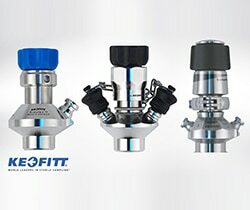 The KEOFITT SESAME Sampling Valve is KEOFITT's newest and patented dual-seat sampling valve. Truly unique in the market, it offers optimal CIP and SIP conditions while also incorporating steam supply control and completely eliminating the steam inlet dead-space in other designs. The Keofitt® Micro Ports are designed to take samples using a Hypodermic needle or a syringe, with minimum risk of contamination. Designed for sampling low viscosity products with microscopic particles in the fluid. The main products Micro Ports are used for have about 0-50cP in viscosity. Simplex is the CIP-able and auto-drainable valve for chemical and/or physical sampling of products with a viscosity up to 1000 cP and particles up to 3 mm in diameter. The KEOFITT Aseptic System enables the user to take a truly representative aseptic sample. It protects the sample against airborne contamination, while extracting the sample, during transportation and storage. The standard operating procedure involves steaming the sampling valve with the KEOFITT Aseptic System connected, in order to sterilize the sampling valve and the connection between the sampling valve and the KEOFITT Aseptic System. This procedure ensures the sterilization of the whole flow path in a closed circuit. The KEOFITT Aseptic System is based on KEOFITT's guarantied high quality, microbiologically safe valve design. It shall be used with PP sampling bottles (# 260325-1 / 260525-1 / 260625-1), which are autoclavable, robust and translucent. The KEOFITT Carlsberg Flask is used in breweries for yeast propagation as well as in other fermentation processes including yogurt cultures etc. The KEOFITT Carlsberg Flask is unique in its design because the lower part allows it to be placed directly on a heating plate for autoclaving. Furthermore, the parts included allow the safe transfer of the product for further processing via pre-sterilized KEOFITT sampling valves and tubing. Carlsberg Flask sterilizes wort and cultivates pure yeast cultures on a laboratory scale for use in yeast propagation plants in the brewery, food, dairy and beverage industries. Designed for sterile sampling the Alfa Laval SB Micro Sample Port enables representative aseptic and microbiological samples to be taken in small volumes from tanks and pipework. Alfa Laval Unique Sampling Valve make it possible to obtain representative samples of food and beverage, personal care and biopharm products. These reliable single- and double-seat valves contribute to quality, and cost-effective sampling.